Here’s a fact I’m sure you can agree with… Nothing created in a laboratory will ever come close to replacing what is already made available by Nature! Today I want to talk about one particularly marvelous gift from Mother Earth and that is: the coconut! In Sanskrit, the word coconut tree or kalpa vriksha, translates roughly to “the tree that gives all that is necessary for living”. Certain islands consider coconuts to be “the cure for all illness” and use all parts of the coconut on a regular basis. Coconut oil is one of those great multi-taskers that we use all the time here at FitLife! Not only does it pack a great nutritional punch, but it is one of the best oils you could possibly cook with because it can be heated to very high temperatures without losing its nutritional integrity or becoming rancid! Even other great oils like olive oil go rancid once heated to certain temps and are better used for salad dressings and other things that don’t need to be cooked. Coconut oil on the other hand is your best friend on the stove, in the oven, in your body and even for your pets and around your home. We’ve spent the last week talking to our readers about how they use coconut oil and we’ve come up with a list of 99 ways to use it for your family, pets and around the house. Once you start using this popular oil in your home you won’t be able to stop! For an effective and relaxing detox bath: Fill tub with warm/hot water. Add two generous spoonfuls of coconut oil, ¼ cup baking soda, 1 cup Epsom salts and 5-10 drops of essential oils of your choice. Soak for at least 20 minutes. The coconut oil will hydrate and cleanse your skin, while also helping you absorb the benefits of the essential oils. The baking soda helps to pull toxins from as well as alkalize the body (Our body is built to have a pH that is slightly alkaline, but the typical American diet is extremely acidic. Disease thrives in an acidic environment, but cannot survive in an alkaline one so soaking in a detox bath provides huge benefits!). Epsom salt is high in magnesium; the second most abundant element in humans cells. It helps to regulate over 325 enzymes and helps with numerous bodily functions. Fun fact: It’s estimated that roughly 80% of the population are deficient in this mineral, often unknowingly. 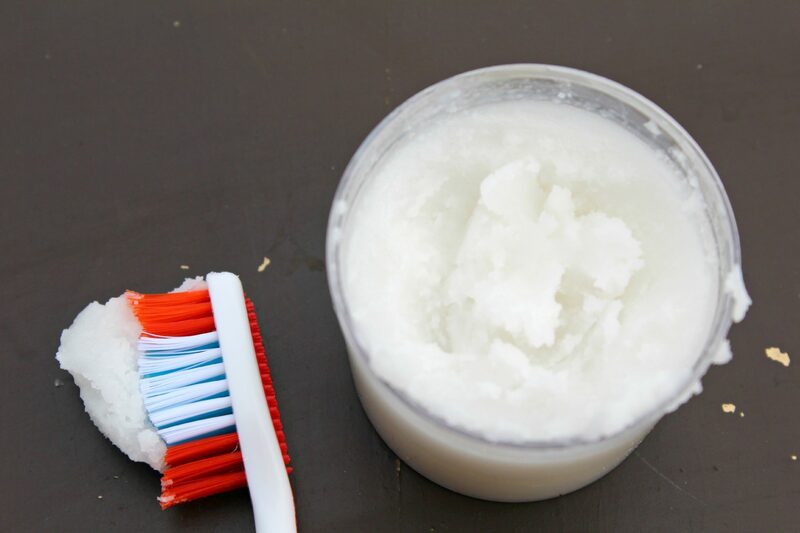 Oil pulling is a simple yet effective way to cleanse your mouth and gums. You do it by swishing a teaspoon up to a tablespoon of coconut oil in your mouth for about 20 minutes. The reason it’s called oil pulling is because the oil literally “pulls” out toxins, waste and debris from where it resides in your mouth. Your mouth is a very popular place for bacteria and toxins to gather, so not only will Oil Pulling help whiten your teeth, it will help cleanse your body and improve your lymphatic system. First, floss your teeth, or swish first thing in the morning when you wake up, before you’ve eaten or had anything to drink. Next, put one teaspoon to one tablespoon of oil in your mouth (work your way up to 1 Tbs.). Swish for 20 minutes – set a timer (if you need to start with 5 minutes, that okay but to reap the benefits completely, you’ll want to work your way up to the full 20 minutes) Insider tip: swish in the shower and your time will fly by! Next, spit the oil out in the garbage or toilet (spitting the oil in the sink can clog your drains so don’t do that!). Rinse your mouth several times with warm water and be sure to spit it out (you don’t want to re-ingest those toxins you just worked so hard to free). Brush your teeth within 10 minutes (some people prefer to do this right away and others wait, do what feels right to you). Place all ingredients, except the essential oils in a quart mason jar. Boil a pot full of water placing the uncapped jar sitting inside. Make sure to stir regularly until all the ingredients have melted completely. Let it cool down, and add in the essential oils and stir. Once dried you can pull from the molds and use however you like. Acne is an infection that occurs when the opening of the sebum glands in your skin become clogged. The sebum glands are responsible for keeping the skin moist as well as help to prevent cracking. When they become clogged with bacteria, inflammation occurs and eventually, acne. Coconut oil replaces the protective acid layer on your skin, which is lost through too much washing and scrubbing by those frustrated with stubborn pimples. It is also rich in vitamin E, which helps the sebum glands function properly. When coconut oil is applied to the face, it is absorbed quickly and will help to reduce and get rid of already existing acne. Before going to bed and after showering in the morning, wash your face gently with warm water and then apply coconut oil in circular motions over infected areas. You can also mix with a few drops of tea tree oil. Who doesn’t want a full and luscious head of hair? Coconut oil can be rubbed into the scalp to help stimulate hair growth as well as create a shield to protect the hair roots from damage. Applying coconut oil to the hair daily will provide and hold in moisture that keeps the hair from breaking or heat damage. Giving your scalp a little massage with coconut oil will also increase circulation and boost nutrient delivery to your hair. For a great hair treatment, warm up a few spoonfuls of coconut oil and dampen your hair. Put the coconut oil in your hands and massage into the scalp for about three minutes. Cover your hair with a shower cap and leave it for 30 minutes minimum, or overnight for best results. Afterwards gently rinse out your hair with shampoo. Mash together baking soda and coconut oil. Mix in the essential oils to form a paste. Store in a glass jar and dip your brush in when you are ready to use. Massage Therapy can be an important healing tool for increasing circulation and helping the body relax and release stress. Coconut oil is perfect for massage as it is a very stable oil with mostly medium-chain fatty acids that won’t go rancid or invite infection. It also coats the skin with a protective layer that holds moisture in and helps to prevent dryness and cracking. The vitamin E content rejuvenates and keeps the skin looking youthful and healthy. Coconut oil is a great hand moisturizer. 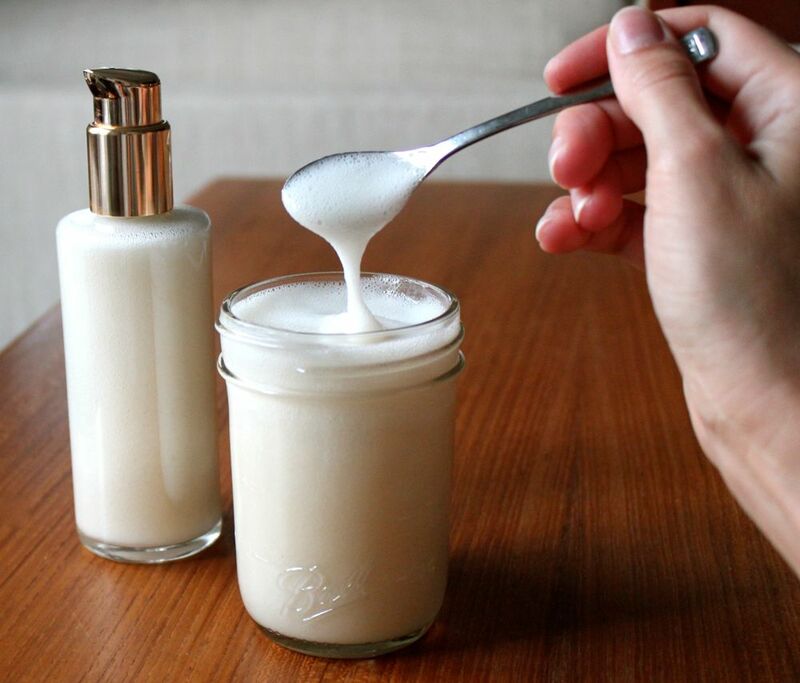 Making your own hand soap is easy and can save money in the long run. Not to mention you will know exactly what ingredients you are putting on your hands every day. Fill up a foaming soap dispenser ¾ of the way with water. Replace pump and shake well to mix ingredients. Coconut oil works as a natural laxative and provides slippery fat your body can use to help stool slide smoothly through your system! It can also relieve bloating in the digestive tract that might be caused by constipation or toxins. The medium-chain fatty acids in coconut oil provide quick energy to the cells in your intestine, which in turn increase metabolism and soften your stool. For severe cases, take ½ a tablespoon morning and night, increasing the dose to 1 tablespoon if needed. Coconut oil is a safe and very beneficial oil for animals. You can mix a spoonful into their food daily for an immune booster and digestive support. You can also use it externally to help with skin conditions and for a smoother and more luscious coat. Most of you are watching this video and reading this blog because you want you and your family to feel better, live longer and overcome illness and disease. We are on the same journey at Fitlife and are committed to helping millions of people transform their lives. We know changing your life is not always an easy thing. But we also know that you are strong enough and completely capable to make it happen! >>> Get our mini-book complete with 99 Ways To Use Coconut Oil here. Using coconut oil is one small step you can take towards improving your health, from your very own home. And if it is already in your home, we hope we’ve given you a few more ideas of how to use it. We can’t wait to hear about your experiences. If you’ve found this information useful, don’t forget to share it! Congratulations, Klee! We appreciate your story.